New Directions Publishing Corporation, 9780811225502, 576pp. 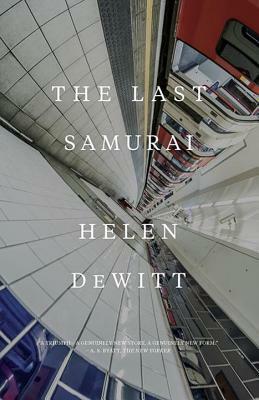 Helen DeWitt's 2000 debut, The Last Samurai, was "destined to become a cult classic" (Miramax). The enterprising publisher sold the rights in twenty countries, so "Why not just, 'destined to become a classic?'" (Garth Risk Hallberg) And why must cultists tell the uninitiated it has nothing to do with Tom Cruise? Sibylla, an American-at-Oxford turned loose on London, finds herself trapped as a single mother after a misguided one-night stand. High-minded principles of child-rearing work disastrously well. J. S. Mill (taught Greek at three) and Yo Yo Ma (Bach at two) claimed the methods would work with any child; when these succeed with the boy Ludo, he causes havoc at school and is home again in a month. (Is he a prodigy, a genius? Readers looking over Ludo's shoulder find themselves easily reading Greek and more.) Lacking male role models for a fatherless boy, Sibylla turns to endless replays of Kurosawa's masterpiece Seven Samurai. But Ludo is obsessed with the one thing he wants and doesn't know: his father's name. At eleven, inspired by his own take on the classic film, he sets out on a secret quest for the father he never knew. He'll be punched, sliced, and threatened with retribution. He may not live to see twelve. Or he may find a real samurai and save a mother who thinks boredom a fate worse than death.